For a writer, it's enough to put on paper and publish a book like A Portrait of M to immediately stand out from the vast group of "literature-makers", of craftsmen of empty words that don't describe, express or cost anything. The experience transfigured in this book, which critical superlatives could only unconvincingly and remotely describe, is a three-fold one. Father, friend and writer: three roles and characters revolving around the same hero, Matthew, who suffers from autism and epilepsy and who passes away before reaching 26. The fact that A Portrait of M remains nevertheless a luminous book might seem uncanny, almost unbelievable. The father's grief is not expressed through morbid visions and doesn't depict existence and its purpose - or that metaphysical dome under which human dramas sometimes gain meaning - in bleak colors (be they of mourning). 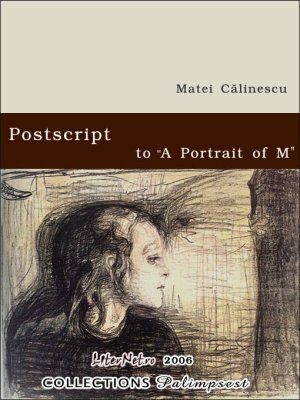 In Matei Calinescu's pages, grief tasted to the fullest is crystallized in an attempt to embrace and understand the story of M; in a deeper understanding of the lessons M teaches his father and all those around him; and finally in a subtle change of self, brought about by the intimate contact with the son's warm heart. This Postscript continues to fill in the blanks in Matthew's array of illnesses and in the network of relationships that the "solitary" autistic boy built with those around him. While the two texts (the book itself and the text that comes to complete it) are similar and related in theme and subject, they are different in dramatic ardour and in their intentionally white, non-pathetic and subdued tone, because of the time difference between the accounts. A Portrait of M shifts continuously between a care-free past, another past clouded by the evolution of M's disease and the mournful present that follows his passing away. The perspective changes often, older uncertainties alternating with the new painful truths discovered progressively. In the Postscript, the "case" of Matthew's diseases is almost closed and the grieving father has long given up any hope regarding his son's destiny. Memories are all that's left, and the father delicately and lovingly explores them, sometimes hesitating over the meaning of certain events, but painting an increasingly vivid and precise portrait. The fragments we read become doors that open onto M's past, crafted by a man that himself belongs to the autistic phenotype in a broader sense - the introverted man, aloof in his relations with other people, solitary by definition. The writer's quintessential solitude and the son's autistic solitude will become impressively and magnificently intertwined in a painfully wonderful definition: "His mind was essentially solitary. I imagine it as a clear inner sky, translucent blue, like that of a late-summer night, untouched by the clouds of dreams, nostalgias, memories, plans or even hopes". After finishing reading A Portrait... and the Postscript, we will return to our mundane preoccupations, combinations, duties and obligations. But we will feel somewhat ashamed of them, because we will have been transformed in more than one way by M's story.